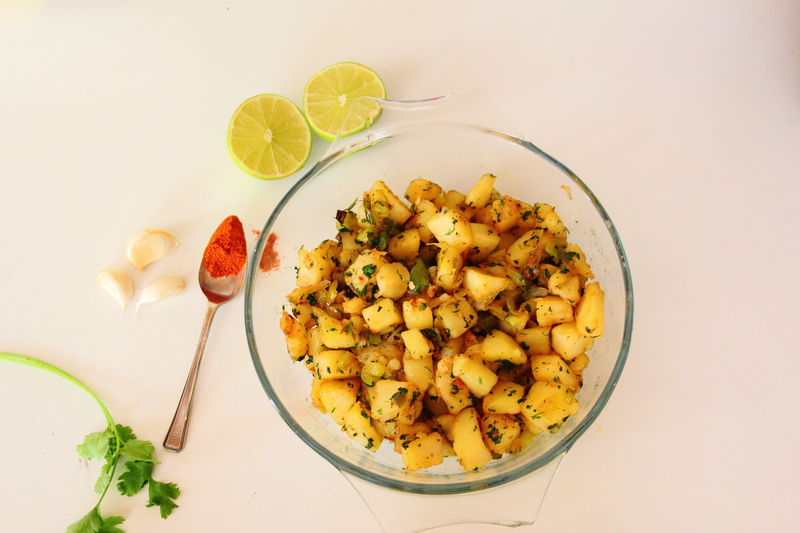 Batata Harra (Spicy Potatoes) – Flogging Delicious! Anyone who knows me well knows that my absolute favourite ingredients in life are garlic, coriander, lemon/lime and chillies (you’ll probably spot the trend in some of my recipes…). It’s safe to say that these ingredients, when combined, create dishes that pack a serious punch! So it’s with great pleasure that I may introduce my version of batata harra, or spicy potatoes. Made with all of the above, you can imagine how I feel that this dish was made with me in mind! Found in countries like Syria and Lebanon, these spicy potatoes go well with fish because of their zingy flavour. They’re also great as a side to grilled meats, as part of a mezze platter, or loaded full into some pitta bread – carb fest anyone?! Usually recipes for this dish opt for the potatoes to be cubed and deep fried, as you might do to make fries. But I find that if you parboil the potatoes first and then fry them, they turn out lighter and come out really nice and fluffy. You can, of course, handle the potatoes however you prefer and if you don’t want to be faffing around with boiling water and extra pots and pans, you can head straight for the deep fryer. The first thing you are going to need to do is to set a saucepan of salted water to boil. Then, peel and dice your potatoes into cubes about 1 cm thick. Once cubed, rinse them in cold water and strain. Your water should have reached boiling point by now, so add your potatoes and cook for about ten minutes. They need to have started to soften but still be firm in the centre. While your potatoes are boiling away, finely chop your spring onion bulbs, green bell pepper and coriander and set to one side. Now you can set your rapeseed oil to heat up and, once hot (you can test the oil by adding a cube of potato in. 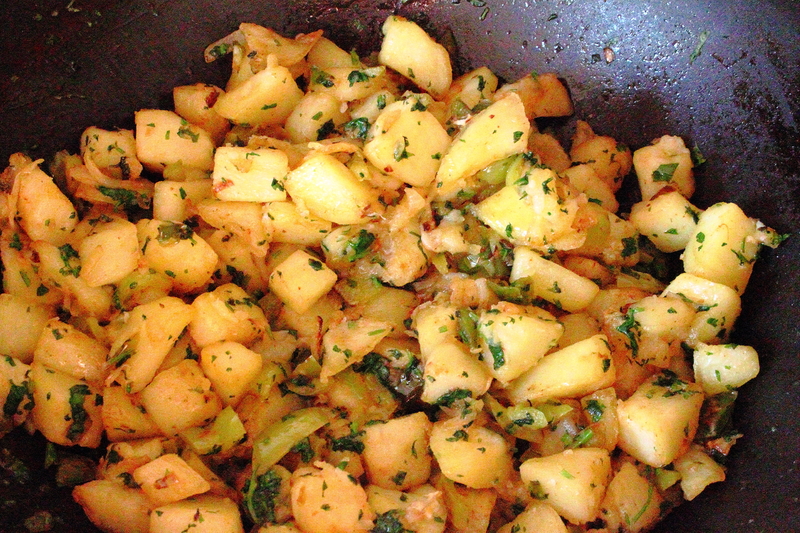 If it sizzles, go for it and add in your potatoes, frying until lightly golden (about ten minutes). When you see that your spuds are starting to change colour, add 1 tbsp of olive or rapeseed oil into a large frying pan and fry off the onions and garlic until softened. Then add your crushed garlic and sauté continuously for about 1 minute. It’s time to strain your potatoes and add them straight into the pan, along with your chilli powder, salt, coriander and lime juice. Toss until all the potatoes are well coated and serve immediately.